Wedding Entertainment for Wedding Receptions and Ceremonies. Congratulations, now it’s time to plan the wedding entertainment. Thank you for considering Black Tie Group for your wedding entertainment. Perhaps one of the most important services for a wedding reception is booking the right Entertainment to create that special atmosphere that you desire. As it is the most important day of your life, saving a few dollars on entertainment really shouldn’t be an option. You wouldn’t want a garage band or an inexperienced DJ spoiling your perfect day by playing the songs they want to hear at inappropriate volumes etc. When reminiscing about weddings, most people remember two things, the quality of the food and the quality of the entertainment, therefore booking the right DJ or Band is of the utmost importance. Our office team is managed by “real professional entertainers”, that have previously performed at weddings for over two decades. They are extremely particular when hiring new wedding entertainer’s and believe their cover bands and DJ’s are the best that Australia has to offer. Guests arrive and drinks are served. Guests are greeted at the door and moved to their seats. MC requests everybody be upstanding for the entry of the Bridal Party. Bridal Party enter and are seated, Bride and Groom are last to enter, wedding entertainment plays the requested /entry song as Bride & Groom Enter. MC seats guests and introduces him/herself and announces the format for the evening. Entree and/or main course is served. Toast to the Bride and Groom. While Groom is still standing – Groom proposes a toast to the Bridesmaids. Best Man responds on their behalf or Bridesmaids respond. Toast to the Bride’s Parents. Toast to the Groom’s Parents. 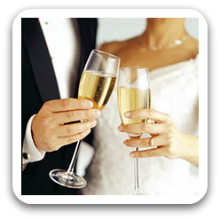 Toast to the Caterers, Chauffeurs, wedding entertainment etc. MC calls on the Best Man to read the Telegrams. Someone proposes a toast to the MC. MC responds and announces the Cutting of the Cake, wedding entertainment plays the requested song. Wedding DJ / Wedding Band then calls the Groom and all of the gentlemen to the dance floor for removal of the Garter from the Brides leg either by hand or teeth then throws it to the gentlemen. Wedding DJ / Wedding Band then calls everyone else to the dance floor to form a farewell Wedding circle, Bride & Groom then make their way around the circle to say their goodbyes individually to guests. Finally the Wedding DJ / Wedding Band asks guests to form a human archway for the Bride & Groom to exit to their honeymoon.